This project should go out to the die-hard, ultra loving original contemporary jazz lovers of the 70’s & 80’s! Not to mention, the CD will take many of you back into your vinyl collections (especially the serious vinyl collectors) & pull out most of the CTI & Columbia labeled LP’s that floated both sides on your turntable. For producer & multi-talented Jason Miles searched & went deep into his repertoire & brought back to life many of the greatest Grover Washington classics from that era. In “2 Grover With Love”, Mr. 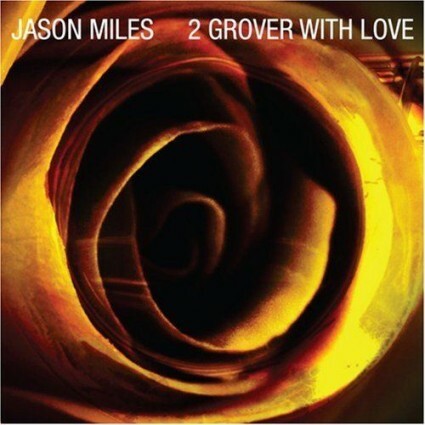 Miles continues to send some of his best work to the legacy of Mr. Grover Washington Jr. With considerable assistance from a slew of special guests, Jason went with an initiative to draw the same fire & passion performed on those same track selections from the CTI & Columbia days & transfer those elements into a 2nd volume of Grovers endearing compositions for today. The Personnel: Chuck Loeb (Guitar), Gerald Veasley (Bass), Buddy Williams (Drums), Ralph MacDonald (Percussionist), Andy Snitzer (Sax), Najee (Sax), Dominick Farrinacci, Jay Beckenstein, Kim Waters, Dean Brown, & Vocalist Maysa Leak. Where do I start? Well, naturally the opening track seems to drift your intent or feel for the entire CD. But after listening to “Mister Magic” & hearing Maysa Leak validate the original with her sultry vocal appeal, I figured from this point on, its ON! I mean, I haven’t heard an authentic vocal to Grover’s “Mr. Magic” before. Maybe I did, if only I could get a soundcheck from my memory bank, but while she connected softly alongside another sax player I dig – Andy Snitzer -, there was no way around it!! This was the one! Here goes the “*”! “The Saddest Thing” sounded almost like the exact recording from Grover’s album. Almost! Except the exceptional solos on the trumpet from Dominick Farinacci & the relentless sax flow from Kim Waters outdid themselves for the cover. ; Sax Star Najee takes you there in “Make Love To You”, as it drifts the pure gift of a memory lane into automatic motion & transforms the rest of your listening pleasure to something darn near the aspect of actually playing this one back on the record player. Except you won’t receive/hear the same crispy & often particular nick sounds a diamond stylus would give ya’. It sounds pretty close though, No doubt! Ok. That’s It. No more needed to be said about the rest. Bottomline. Why spoil y’all too soon? Jason & The crew outdid themselves & perhaps landed another memorable collection of songs to place next to the statue or biography of Grover’s portfolio. This project, just for the heck of it, should be released on vinyl as a limited edition as well as the original digital format! And you know, that wouldn’t be a bad idea, huh? Next to nothing, the record shines throughout & its stellar, no holdin’ back approach in the studio paid off dividends. I couldn’t say enough about this release. Its so good, that if you are a vinyl collector like myself, or have any of Grovers’ records from the 70’s & 80’s, it just may make you go back, get them & dust them off for immediate playback. That was the temptation I gathered after playing this supreme piece of good music back! Get ready for the purchase. Its every bit worth every dollar spent! From Side A to Side B…And flippin’ the record over again.